If you’re tired of spending family days in the metro, why not try to travel down south and check out Nuvali’s annual lights and sound show. Just in time for the long weekend, Nuvali in Sta. 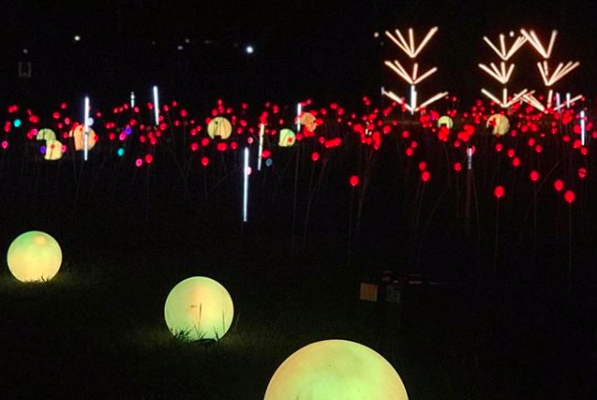 Rosa Laguna lights up a 3,600-square-meter field with 5,000 tulip LED lights and laser lights. There’s also a beautiful light installations of Christmas trees and a 50-meter light tunnel around the area. Like the one in Makati, a large Mickey Mouse-shaped and other Disney-themed installations can also be seen in the open field. Disney tunes are also played every 30 minutes. Childhood feels! Entrance is free on a first-come, first serve basis. But if you want to get a “fast pass” access, you can give a minimum donation of P50. Part of the donations will go to the Hero Foundation. Nuvali’s Magical Field of Lights opens on November 24 until January 13, 2019, from 6PM to 10PM.